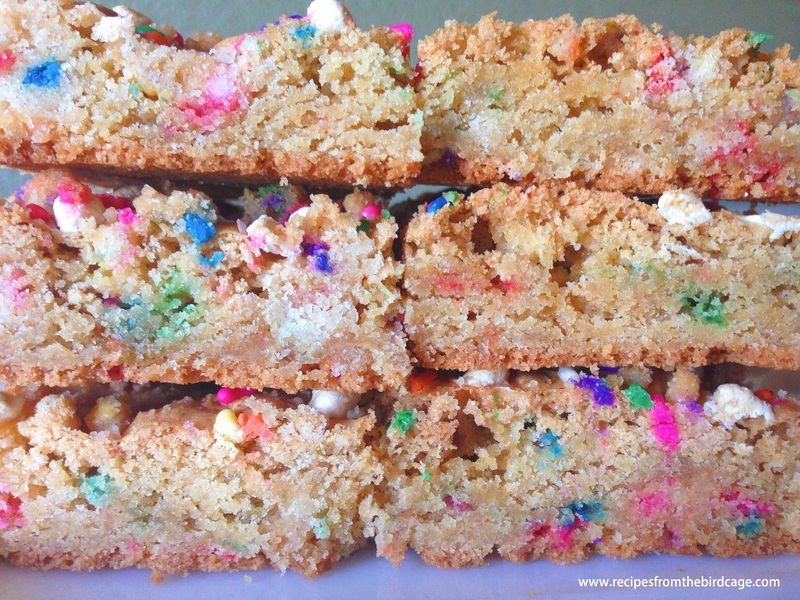 confetti marshmallow blondies. 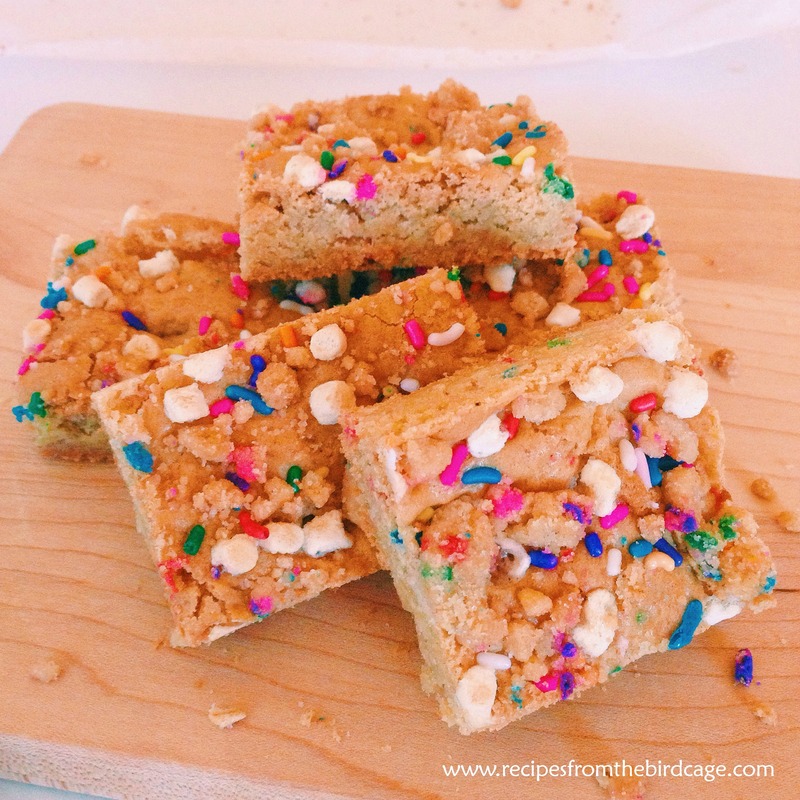 – recipes from the birdcage. I spent this past weekend gallivanting around Dallas with my best friend, who out here in the Metroplex visiting me for the first time since I’d moved here. But, anyways, I’m not keeping track. It was really nice to have her out here. I can’t really say that we did more than chit chat, eat, drink coffee, eat, and eat again, but seriously. Best. Weekend. Ever. We stopped over at Bisous Bisous Patisserie in Uptown. What should you order there? Um, everything. Seriously. Just toss your wallet on the counter when you walk in. Then we walked over to Dude, Sweet Chocolate where we sampled one of everything in the store and bought nearly as much. Look for an upcoming post using Chef Katherine Clapner’s Apple Moon Pie Potion Chocolate Sauce….if I don’t drink it all first. You do not *have* to make the Birthday Cake Crumb. 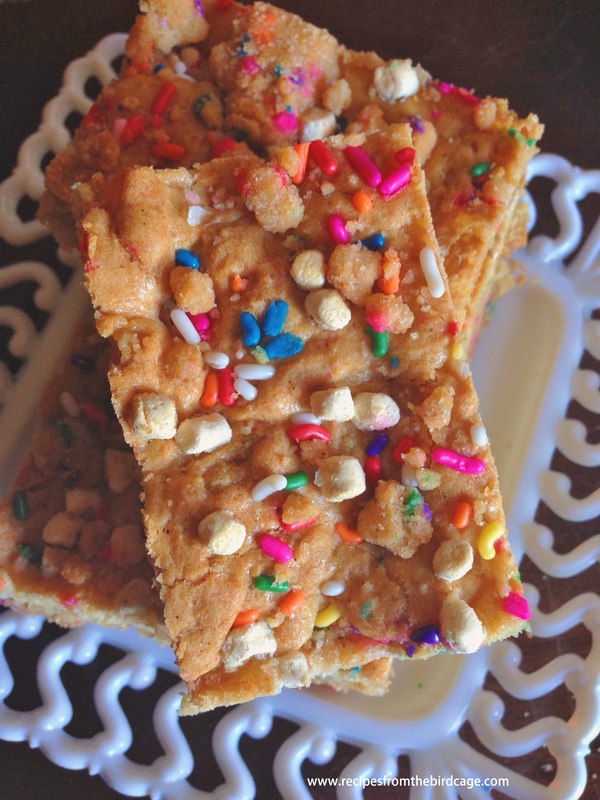 These blondies will be just as delicious without them and I have written the recipe without them If you care to add them, mix in 1 cup at the end along with the sprinkles and marshmallows. 1. Preheat oven to 350. Line a 9×13 baking pan with parchment paper, with overhang. 2. In a large mixing bowl or bowl of your stand-mixer fitted with paddle attachment, beat together butter, sugar, eggs, and vanilla. 3. In a small bowl, combine flour, baking powder, and salt. Add to mixer and beat until just combined. 4. With mixer running on low, dump sprinkles (reserving 2 T.) and 1/2 cup marshmallow bits and stir just until combined. 5. Pat dough evenly into prepared 9×13 baking pan. 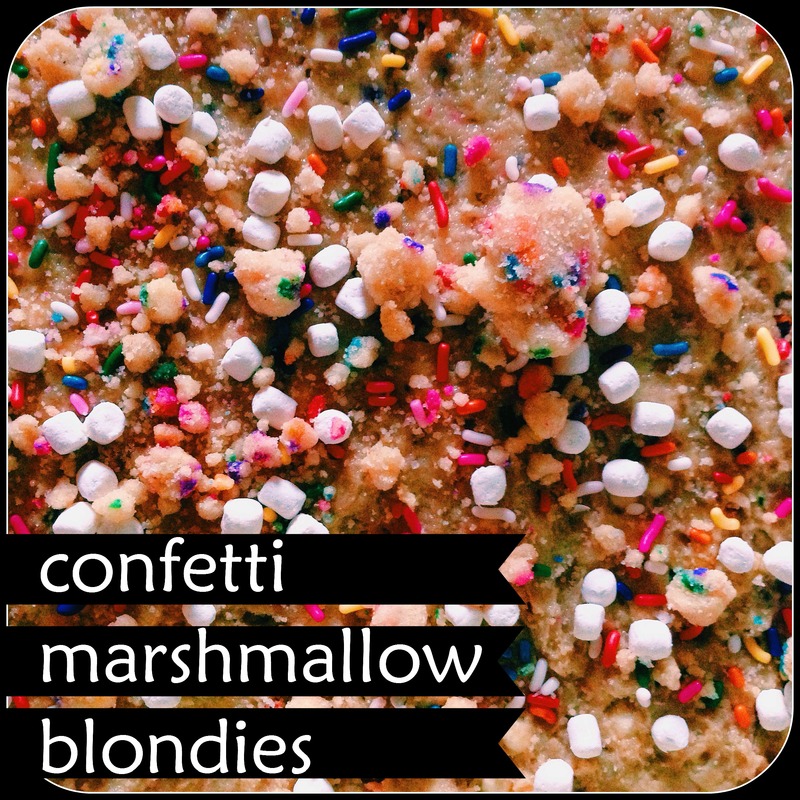 Sprinkle with reserved sprinkles and 2 T. marshmallow bits, patting lightly into dough. 6. Bake in preheated oven 25 – 30 minutes or until edges are golden and toothpick inserted into middle comes out with a few moist crumbs. DO NOT OVERBAKE. 7. Allow to cool in pan for one hour; remove and with a sharp knife cut into squares. These bars should stay fresh two days at room temperature, well wrapped. If waiting to serve the day after baking, it is best to cut just before serving to avoid dry edges. Pingback: cardamom coconut banana bread. | recipes from the birdcage.